This black and white photograph was taken in 1957 at the site of a historic 1880s arrest. 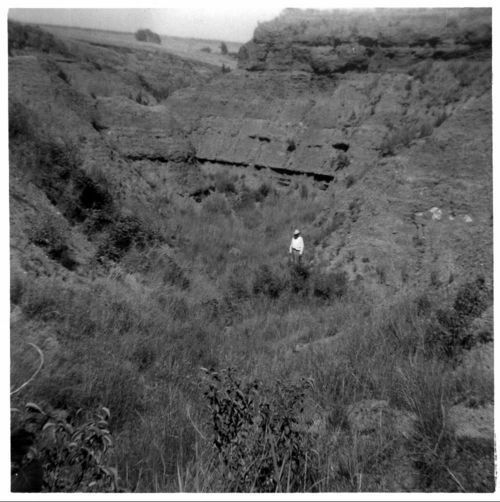 The photo shows a view east into the canyon where Marshal Henry Newton Brown of Caldwell, Kansas and his fellow bank robbers were cornered by authorities. On April 30, 1884, the group of outlaws had robbed the Medicine Valley Bank in Medicine Lodge, Kansas. After two hours in the canyon, the men surrendered and were taken back to the Medicine Lodge jail. While attempting to escape jail, Henry Newton Brown was shot dead in a hail of bullets. The fate for the remaining bank robbers was death by hanging.